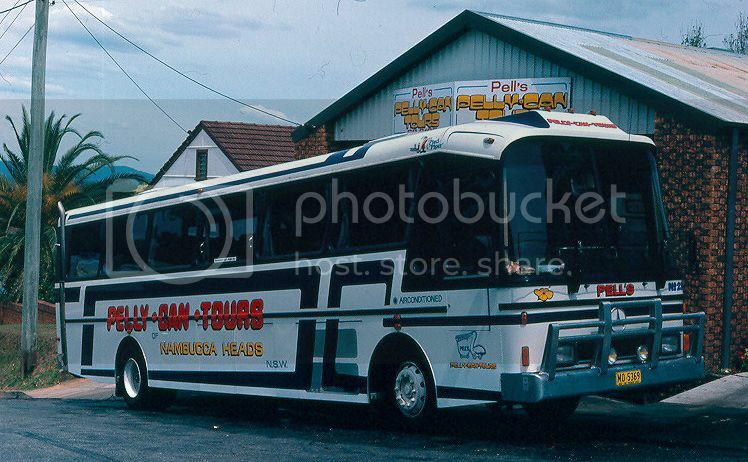 This is a historic listing of vehicles owned and operated by Pell's Bus Service / Pelly Can Tours - Nambucca. School runs: All were operated under the route 358 commercial contract.Buses carried destos. -1)-Macksville Schools-Nambucca Heads Schools-Deep Creek-Valla Road.Desto"-Deep Creek." -3)-Macksville Schools-Nambucca Heads Schools-Valla Beach.Desto-"Valla Beach".Pells longest run. -5)-Nambucca Heads Schools-Hyland Park/Valla Beach.Desto-"Hyland Park".Before the advent of Nambucca Heads High School this one started from Macksville. -6),7),8)-Nambucca Heads Schools-Nambucca Heads Town school services.Just carried "Nambucca Heads"
Jack Pell originated from Castlemaine, Victoria, where he operated a truck business that carted local fruit to local co-operatives, Melbourne and later Sydney. In late-1950, Jack and Len Leech relocated to Shepparton to form a partnership with Ted Phillips of EC Phillips Transport. This arrangement only lasted around 18 months. Jack returned to Harcourt. With his wife, Jack then moved to Nambucca Heads to purchase GP & CK Clement t/a Nambucca Heads Bus Service in May 1963, consisting of a house, depot and four AEC buses that ran the services to Macksville and Viewmont. 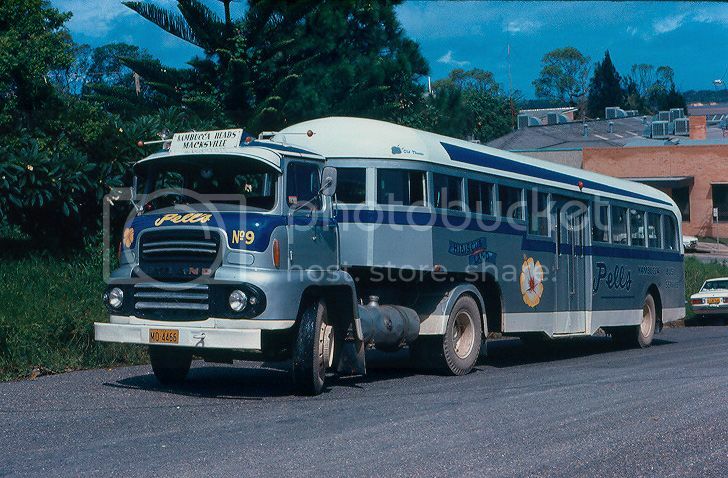 The business was initially LA & JP Pell t/a Pells Nambucca Bus Service and was registered as Pells Nambucca Bus Service Pty Ltd on 3 March 1982. The first buses ex Clement were numbered 1 to 4 and all later additions have been numbered sequentially upwards with the highest fleet number indicating the latest purchase. Subsequent additions to the fleet have included a number of Albions, Leylands and two Rolls-Royce-powered Bosnjaks (later repowered with Mercedes-Benz motors), followed by standardisation on Mercedes-Benz chassis. At its peak the fleet reached 15 units. All buses were named with some for obvious reasons, others quite obscure. The fleet was considered to have the best kept braking systems in the state as the depot has quite a steep driveway! The name Pelly-Can Tours was adopted for the charter and Australia-wide touring side of the business. The first coach purchased by Pell's was a Watts bodied Albion Viking with jet air, 6-speed gearbox and rear-mounted Leyland 401 engine. This was followed by an ex Pioneer GM Sceniccruiser, claimed to be the only air-conditioned coach between Newcastle and Tweed Heads when it was purchased. The third coach was an RFW / Smithfield ex Riverstone Bus Service with a GM 8v71 motor, 5-speed box, 2-speed diff, dual-wheel tag axle, three different types of suspension and an auxiliary-powered air-conditioner. Pell's first new coach was an unusual combination of a Domino Tourmnaster chassis fitted with the Starliner body, which was lower than the Tourmaster body, allowing the coach to fit into the depot shed. The first Mercedes-Benz coach arrived in 1983. In 1989, Frank Partridge Public School opened at Nambucca Heads, followed by Nambucca Heads High School adjacent to the Public School in 1992. This resulted in a reorientation of Pell's services into the Nambucca schools, so that in early-1993 only three school buses were serving Macksville High School. Jack Pell's son Paul Pell was managing the business from at least the early-1980s. 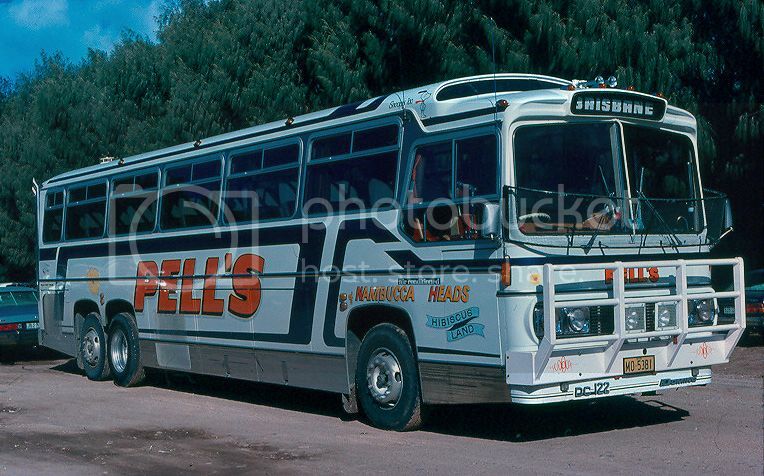 Jack Pell sold Pells Nambucca Bus Service Pty Ltd to neighbouring Macksville operator Newman Bros Bus Service (Botsford Holdings Pty Ltd) on 1 July 1998. He passed away six weeks later. 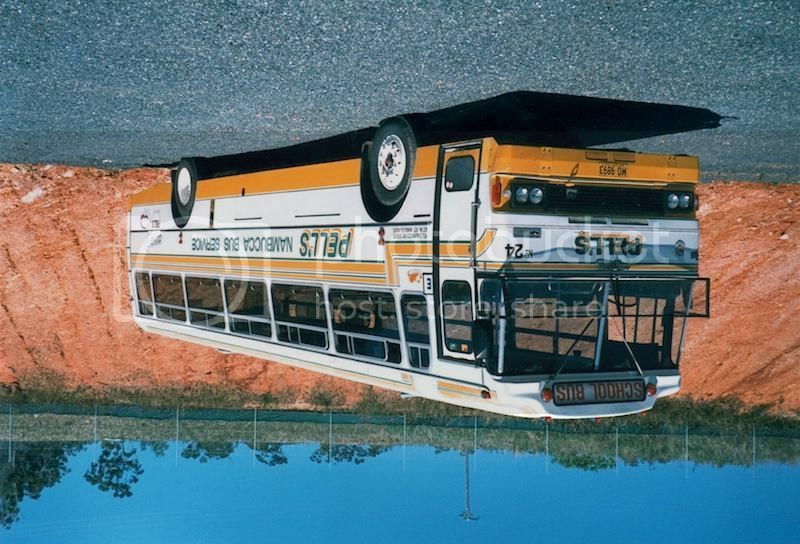 Ron and Stan Newman adopted the trading name Nambucca Bus Service and relocated the depot to the industrial estate near the High School in Nambucca Heads. The combined Newman's and Pell's operations were taken over by King Bros Bus Service (Nambucca Valley) Pty Ltd on 1 July 2000, resulting in the former Pell's vehicles being scattered around Australia. According to the Transport Wall of Fame, Jack's grandchildren Damien and Tiffany Pell still drive buses daily on the Macksville service. Jack Pell was inducted into the Transport Wall of Fame at ReUnion 2009. Acknowledgments:- Hodgson, P, "Buses in Nambucca Heads and Macksville" in Fleetline, Vol 18, No. 214, May 1993, pp.84-91 & the Transport Wall of Fame (http://www.roadtransporthall.com/p/576-09-pell-jack.html).